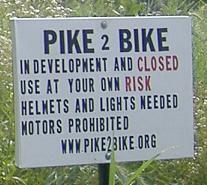 The Pike2Bike trail has been "in development and closed" for several years, ever since the Pennsylvania Turnpike Commission turned over 11 miles of its 13-mile abandoned section of highway. All the best parts of the abandoned Turnpike are on this trail - the original ramps from the I-70 interchange and both original two-lane tunnels, the Ray's Hill and Sideling Hill Tunnels. While the trail is "closed," the second line, "use at your own risk" is much more appropriate - the entire trail is legally traversable, and while the tunnels are less legal, there aren't exactly police officers waiting in the empty ventilation ducts. It's a biker's dream, a hiker's paradise, and hopefully you know how to climb. As a final note, trust me, helmets and lights are definitely needed to get through here - the tunnels are pitch-black and over a mile long, and chunks of tunnel may decide to fall on your head randomly. Enough with the text, on with the links! General notes from biking the trail: A flashlight simply won't cut it. You'll see about five feet in front of you inside the tunnels, and most of what you'll see is chunks of concrete scattered on the pavement, any one of which can gouge a beautiful hole in your bike or you. Most of the Turnpike is uphill. That's an overstatement, but there is only one downgrade (heading east from the Ray's Hill Tunnel) that really lets you get up any speed. If you do break 10 MPH, be very wary, because the good side of the road switches between the westbound and eastbound lanes, and the bad side can be pretty horrid (at times, the asphalt is nearly gravel). Do stop and talk to the other bikers - you just might find out that one is the owner of the tours that run the Pike2Bike trail and learn a lot more than you knew before. And if you're lucky, he'll lead you up into the Sideling Hill Tunnel (go up the east stairs; the west stairs are mostly missing, as you'll see within those links I gave you). At the very least, you may find people with more light than you have, or more food. Also, do be aware of where the connecting roads and driveways lead, if you need to leave the trail for any reason. In an emergency, cell phone reception may not be the best, but your best bet is to wait for someone to come by (assuming you're out there on a reasonably clear and warm day) and not try to reach a major highway. Armed with these tips, there are a few different places to park. "The back of the Ramada" is the one I was told, but I discovered a nearly empty truck parking lot next to the hotel, which is where you can get onto the section by the original Breezewood interchange. That's officially owned by the Turnpike, by the way, so be aware you're trespassing (I didn't find that out until I met Mr. Pike2Bike himself). You can also park in the crook of Tannery Road, just east of Breezewood. Finally, if you do go, get some great photos, and put them online, please link back to me!